Nextera Communications is made up of a diverse group of employees who share a passion for delivering exceptional services exceptionally well. As a culture, our employees are a family-oriented group of people involved in their local communities on a daily basis. From supporting hockey in Duluth to running in Grandma’s Marathon and volunteer work, Nextera has established roots in the Minnesota communities it serves. As a Minnesota owned business, Nextera Communications connects with the community and supports organizations across the state that are making a positive impact. The company encourages and provides staff with opportunities to attend community events and volunteer their time. 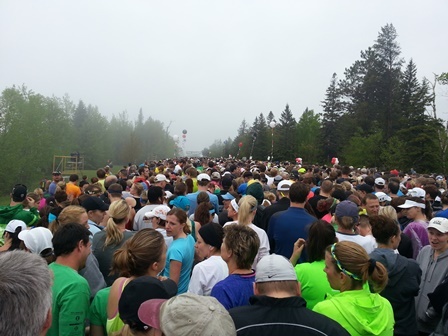 Dan Headlee, Nextera Controller, participates in Grandma’s Marathon in Duluth. 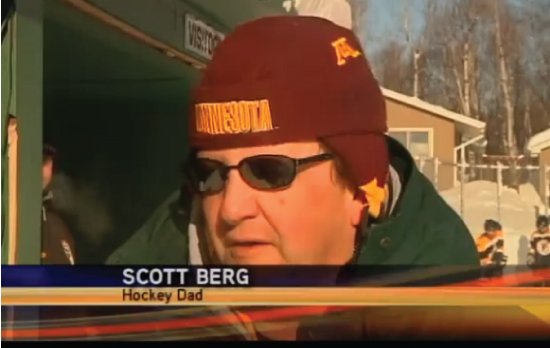 Scott Berg, Nextera Account Manager for the Duluth area, is a hockey parent volunteer. In the Greater Minneapolis-St.Paul area, we’re active members of the Eden Prairie, SouthWest Metro, Lakeville and I-94 West Chambers of Commerce. Outside of the Metro area, we belong to the St. Cloud, Brainerd, Duluth and Hermantown chambers. From networking at business luncheons to serving as a sponsor for some of the many fun and informative events offered by each organization, it’s a privilege to be involved in the robust chamber communities. Todd Anderson, Director of Sales for Nextera Communications, talks to guests following a presentation on fixed wireless for healthcare organizations at a SouthWest Metro Chamber of Commerce event. 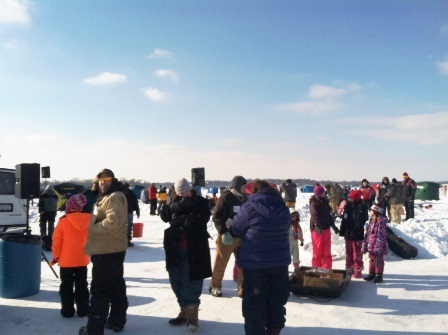 Nextera has been involved with the Holes for Heroes Ice Fishing Festival since its first event over four years ago. Holes for Heroes connects soldiers away from home with loved ones attending the Minnesota festival. The event also offers an afternoon of ice fishing, fun, and food to military members and their immediate families. Fishing for Life, a nonprofit organization supporting families and communities through fishing and outdoor programming, organizes and hosts Holes for Heroes. Nextera has donated the Internet bandwidth used to connect men and women serving overseas with family members attending the event. “It’s an honor to help our soldiers connect with family in Minnesota through a live video feed,” said Greg Arvig, President of Nextera Communications. Despite cold weather and blustery winds, crowds are drawn to the Holes for Heroes event for fishing, fun and to honor military men and women. Photo taken at Medicine Lake in Plymouth, Minnesota. Nextera is proud to support the efforts of the Muscular Dystrophy Association through participating in the Eden Prairie-Minnetonka Lock Up. The MDA sponsors research to find the causes of and effective treatments for neuromuscular diseases. They also provide funding for clinical costs, support groups, durable medical equipment, and host a children’s summer camp program. 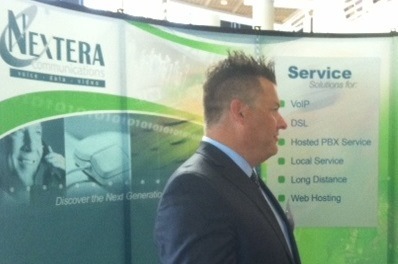 Nextera Account Manager, Eric Senst, at the 2014 MDA Southwest Metro Lock Up. 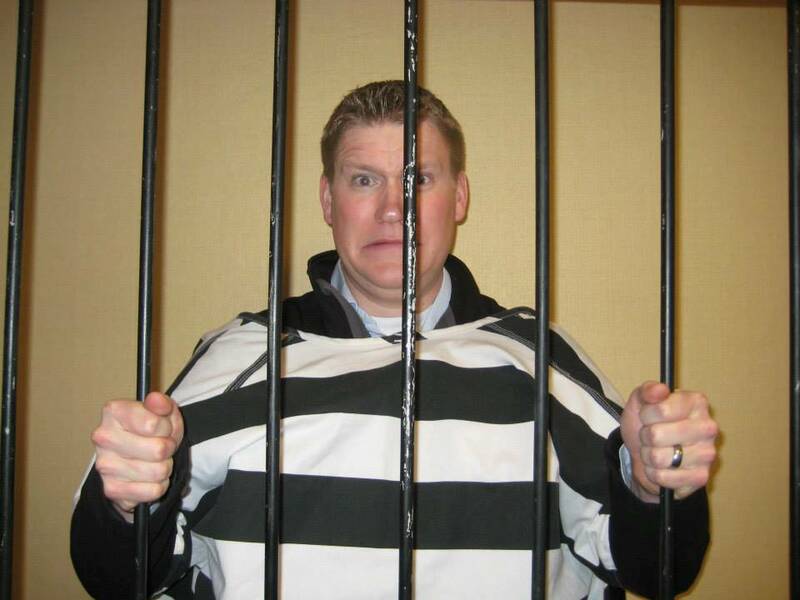 The Southwest Metro Lock-Up raised $39,716 to help children attend the MDA Summer Camp. Nextera supports Kick it Forward Duluth, Arrowhead Youth Soccer Association’s low income programs. AYSA’s first annual Kick it Forward Duluth Soccer Fair was held on April 27, 2014, with almost 1000 children and parents participating in the fair's activities – giving kids the chance to play soccer, compete, and learn from professional soccer players. 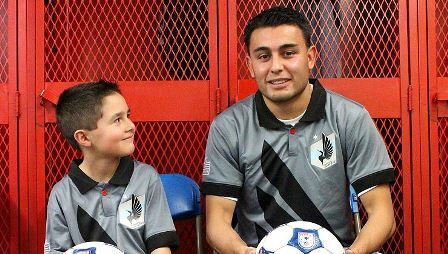 Kick it Forward Duluth provides opportunities for children to learn soccer skills from professional soccer players. The event also raises money to ensure every child in the Arrowhead community who has a desire to play soccer is given the opportunity.